I am just back from my trip a few days ago. I was not able to check my LJ inbox due to poor internet connection so I could not reply to all comments and messages. Sorry about that and I have replied all of them yesterday. Do let me know if I missed your message! Please check the claim list in the preorder post to see whether your name is on the list or not. Freakin' huge. Tons of rare stuff auction-style, normal sales-style... all that fun stuff. Since I decided to become a fire type collector, I told myself I would sell everything else that didn't relate to it. And here it is. Everything I've loved and cherished is right here! All minty, beautiful shtuff. 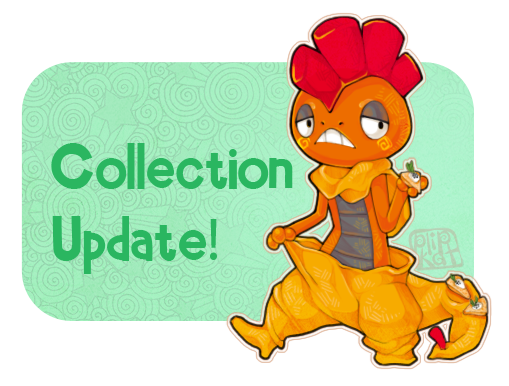 This post includes rare plush, don't miss out! Cause, well, it's all awesome and after all this stuff is gone I won't have anything else to sell. Just so you all are aware, I will be going on a trip to FL in a few days, so chances are, I won't be able to ship out the items until after the vacation which is around June 11. I'm usually a fast shipper (especially during the summer), but if you're wondering why the items haven't been shipped, that is why! Okay! Now on to the sales... but rules first. - I accept Paypal only. - Please include username and item(s) when sending payment so it's easier to sort everything out. - Please don't express interest but then never ever respond again, just let me know what your final decision is. - I will only hold certain items when ASKED to hold them. - I ship from the US. - Haggling will always be considered; just don't be upset if I don't agree with the price! Hello fellow pkmn collectors! I just wanted to share my updated collection with you. 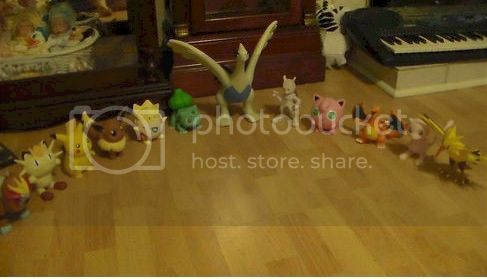 I collect poochyena/mightyena/zorua, but many other pokemon sneak their way into my collection. Secondly: Wants! I am looking for a magikarp/gyarados zukan, but I'm not sure of it's usual price. Also, I think I've seen a flopped over magikarp-only zukan, does that exist? Also the Gyarados TFG (and a Magikarp one if it exists). I'm not quite looking to make a large purchase right now, but I would just like to know what these items roughly go for and if you've seen any around. Hello ! Yesterday, I had an idea. I looked at my cards in doubles, thinking "what am I gonna do with them ?" Thanks for looking!! have a great day. I'm moving into my own apartment soon, and I'm really excited to finally have space to have all my toys on display ;w; (I've been living in college dorms the past couple years). I'm wondering what the best way to display them would be though. After 6 and a half months of looking I finally got my Grail, Natu<3 Now I can get my Natu collection going. 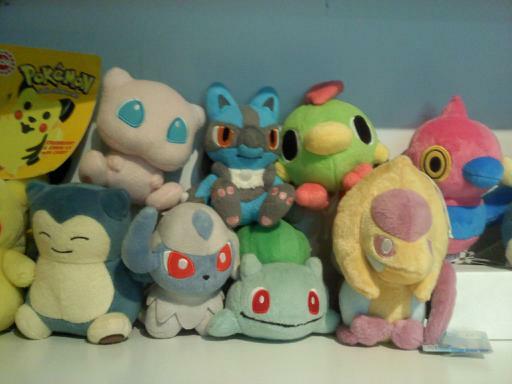 I also got the 2004 Bulbasaur Pokedoll, Absol, Blaziken and Weavile Pokedoll. I got the best deal on all of them. Blaziken still making his way here. I may do pick ups if anyone is interested and if i can get permission. Like i said before i live 3 mins away so i can easily check stock and i know a member of staff so i can find out when new stock is coming in and days that they get deliveries. So, here are my sales. There's a TON of stuff, so there's bound to be something you'll like! Of course whats coming here without looking for a few things? My name's Jamie, and I'm not exactly new to the group, but I've finally gotten the chance to take pictures of my stuff. I've been a pokémon fan since I was introduced to it via the TCG back around '99 or '00. 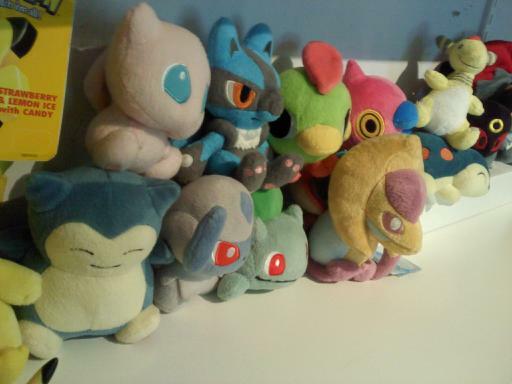 I'm not as big on the TCG as I used to be, and now I primarily collect Munna/Musharna and Bel stuff ( no matter how little the latter gets ;w; ), and with a general focus on plushies and also some various custom/fan-made things. I also like to draw stuff (if you're curious, my dA is RitsuBel), cosplay, and sometimes I do various crafty things as well. Pokedoll sales and other sutff! I'm far too lazy to make a sales banner at the moment, so have some Pokederp and a cut. And I also tend to have a major weakness for the MegaBloks, as I am trying to collect every one of them. Eventually, I hope to put up a post asking you lovely people for certain items of the above. But that is if I can manage to put a hold on my eBay and Y!J rummaging. Ack! I hope that this short intro on me is sufficient? I try not to babble unless I'm excited about something. Good day to you all! also, for all you con-goers out there. Do any of you have any stories regarding amazing gets they have gotten? Or stories involving booties at the con? 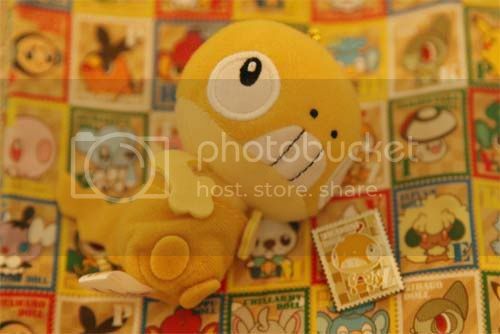 Do you think a guide to Pokemon merch at Anime/Comic conventions would be helpful? I go to conventions and think this would be really helpful! I'm going to be doing pick ups for the Target exclusive Ash and Victini Jakks figure set! ^This is it! I took it out of the package right after this pic was taken. If you comment below for a slot you are committing to pay for the item when it is picked up. Backing out will result in automatic negative feedback. I live right by a Target, so I can go whenever I need to! I'll let you know when I get the item so you can pay. Shipping will be in a bubble mailer! If you would prefer a box please ask. Shipping is $5 for US or $10 to the UK, and for anywhere else I will have to get a quote. Out of the box shipping prices: $4 for US, $8.50 to the UK, and for anywhere else I will have to get a quote. Hey guys, I'm having computer trouble at the moment and my phone is either awesome or a poop when on LJ. I'm not dead, just letting everyone know. Also the plush from the poprockpotato GA got to me in record time! Once we get our new power cable, totals and pictures will be posted. Hello everyone! I've got a huge sales post up ahead. There's a ton of new items, including J Franco & Sons figures, random TOMYs, Applause Plush, Black and White Dominoes and stickers...loads of weird and uncommon things. A lot of prices have been lowered as well. Do I have anything you want for sale? Hey, guys, I'll be doing a pick up run to the PC this weekend to try to help pay for some medical bills. Check it out! Threads up, bidding may begin. Hello all. I've been here for a little while and I've seen a few intro posts so I figured I'd make one of my own. I first got into Pokémon during the initial wave in the late 90's and I've been hooked ever since. Most of what I have is older and thus I don't think anything I have in my collection aside from preorder bonuses that goes beyond the first two generations, but I have had in my possession some apparently odd merchandise. If it's from before Y2K and you're not sure what it is, feel free to PM me a picture and I might be able to tell you what I know. In a fair amount of detail. 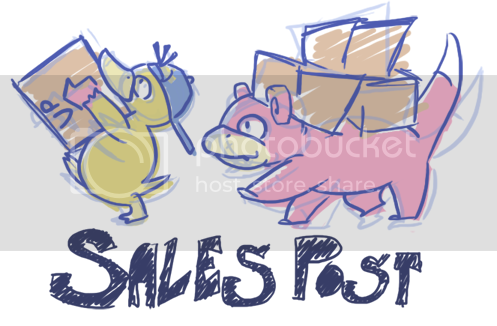 Slowpoke Sales and a small Wants Post! Hello all! It's been a while since I posted last, but I went through an overhaul to my sales post/journal, as I have a bunch of stuff sitting in a box that I'd like outta here! I've got pan stickers, stamps, a few plush, pencils, watches, all kinds of weird stuff. I've also got a small want list to throw out here-- just in case someone has something :D I collect Slowpoke, and am missing just a few things!